I know it’s a little early to say this, but it is what I will hear when I arrive in Tanzania just after Pascha this year. I will respond by saying, “Kweli amefufuka!” Truly, He is risen! This language– Kiswahili– is what you would speak every day if you were growing up in Tanzania. It is what I heard and spoke when I was growing up in East Africa as well. Life in Africa is a little different from life in Cincinnati. If you were going to school in a Tanzanian village, you might not have a school building. Your classroom could just be wooden benches under a thatch roof without any walls. Or you might have a few classrooms in a wooden building with a tin roof. There might be forty students in a classroom, but only twenty desks. If there aren’t enough textbooks, the teacher would write lessons up on a blackboard and you’d copy them down in your notebook. Before school in the morning, you might have to milk the cows and goats, collect eggs from the chickens, and help the family with chores. After school you might weed the garden or help cook dinner. And if you don’t get your homework done before sunset, you’d use a kerosene lamp– many houses don’t have electricity. Does this sound a little different from Cincinnati? Other things aren’t so different. Even if you don’t have electricity in your house– even if your house has a thatch roof– your family will probably have a cell phone. You can go to an internet cafe in the village and update your Facebook status. Your chores in Tanzania might be a little different from household chores in America, but I bet you still have chores. Extended families are very close: you’d probably hang out with your aunts and uncles and cousins and grandparents every day. The whole village might have been baptized in the river at the same time. You would worship in a church that you and your family had built with your own hands. On major Church feasts, you might have a procession through the whole village, and on Pascha everyone would get together to for roasted goat. There are a lot of Orthodox churches in Tanzania. 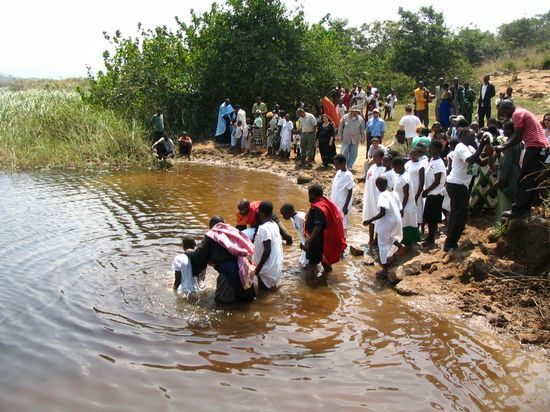 And hundreds of people– often entire villages at once– are baptized into the Church every month. But there aren’t very many priests yet. And the roads are really bad. So a priest like Father Steven might have six parishes to serve in addition to yours. He would ride a bicycle or motorbike from village to village, and you might only get to see him once every other month. 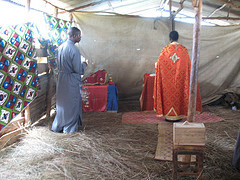 Because you are praying for me and helping me, I will be able to live in Tanzania and help the Orthodox Church there. I will get to teach English in schools. I will get to help translate the Liturgy and hymns of the Church into Kiswahili as well as many other languages, so that people can pray in their own tongue. And I will get to help the bishop, Metropolitan Jeronymos, as he goes out to the villages and helps all the faithful. Thank you for praying for me. Please keep praying for me. And thank you for raising money to help me live in Tanzania. Once I get there, I would love to tell you more stories about what life is like. And I would love to hear from you. Your Church School teacher can help you get in touch with me. In a little while, maybe after Christmas, I might be able to help you find pen-pals your age in Tanzania.